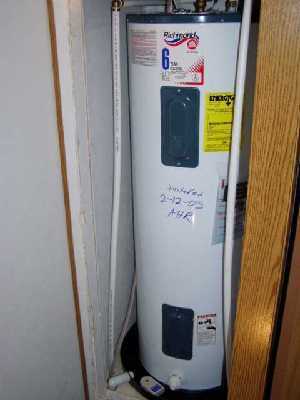 can you use a regular water heater in a mobile home? We are frequently asked, and often too late, if a standard tank style water heater can be installed in a mobile home aka manufactured home. The short answer is No. Manufactured homes have very specific requirements for code compliance on water heaters, and for good reason. Mobile home water heaters will have a H.U.D. safety approval. Anything else used for a mobile home is against the law, will void the manufacturer’s warranty, and will nullify your insurance coverage. Look for a replacement water heater that is made specifically for mobile homes. According to HUD’s Homeowners’ Center all manufactured homes must have water heaters with a non-adjustable temperature and a pressure-relief valve. The water heater installed must comply with the local building codes of the state in which it is located and must be owned by the homeowner, as rental water heaters are not accepted. Standard water heaters are generally not HUD-approved because of the square intake vent at the base, which is not completely sealed. Mobile home water heaters have interchangeable gas and propane orifices so that the water heater can be converted from natural gas to propane gas operation. This is the main reason for the increased cost, as well as difficult access. Water heaters in manufactured homes are typically in very tight spaces and can be difficult to remove and install, many require the removal of doors, door jams and can sometimes need custom cut access to fit the newer models.